ESET is among the select 17 endpoint security vendors assessed by leading analyst firm Radicati, according to two main criteria: Functionality and Strategic Vision. 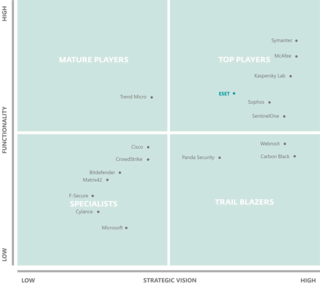 We are proud to announce that ESET is positioned as ‘Top Player’, defined as an acknowledged market leader offering breadth and depth of functionality and a solid vision for future direction. 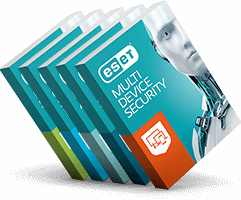 Radicati analysts praised ESET’s consistent performance. “We are impressed by the functionality offered by the ESET Endpoint Security suite, and the way in which the company’s solutions have been designed for ease of deployment and use,” confirmed Sara Radicati, CEO at The Radicati Group. ESET LiveGrid®, a cloud-based reputation system which receives information from ESET’s global network of over 110 million installed sensors, and ESET Enterprise Inspector, its EDR solution, were also singled out as important tools in advanced threat detection. The Radicati report includes a detailed assessment of the strengths and weaknesses of 17 key players in the Endpoint Security market. For a complete overview, download your complimentary Radicati report now. Disclaimer: Vendors and products depicted in Radicati Market QuadrantSM should not be considered an endorsement, but rather a measure of The Radicati Group’s opinion, based on product reviews, primary research studies, vendor interviews, historical data, and other metrics.